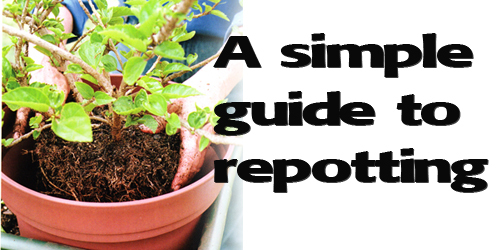 Guide To Re-Potting Garden Planters! Roots protruding from a garden planter's drainage hole is a sure sign that the plant needs to be repotted. Here are a few helpful tips! Most healthy container grown plants will outgrow the confines of their pots. A good way to reinvigorate a root bound plant is to give it a new home. The first step is to recognize when it's time to re-pot. Signs to look for are roots tightly packed or protruding from the pots drain hole, and water sitting on the soil surface to long after watering. The best time to do the re-potting is when they are actively growing, in the Spring or Summer. Root bound plants should slip out of their pots easily; watering first will help. If much of the soil falls free of the roots, then plant may not need to be repotted. Roots should be white or light colored. Black or dark colored are signs of a serious fungal disease. Now is the time to loosen the roots to increase nutrient absorption. Rim the roots and loosen up the ball before replanting either way. 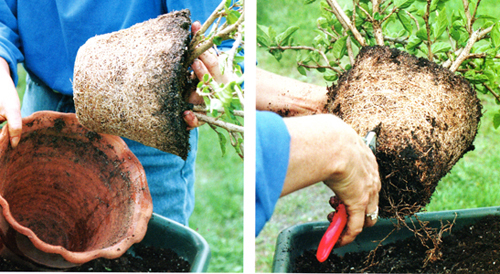 Use a sharp knife or pruning shears removing as much as the bottom third of the plants root ball. The new pots size depends on the plant and its potential growth rate. Rely on your own idea of what a healthy specimen should look like. When in doubt go bigger than smaller at least by a size or two. To keep soil from leaking out the drain hole fill the pot with pot filler. Put a few inches of moist soil in the bottom and position the plant in the pot, centering it. The goal is the root ball should sit an inch or two below the new garden container's rim. Fill the space around the root ball with soil. Finally trim the potted plants foliage relative to how much the roots were pruned. In other words if you take one third of the root ball off then take one third of the top growth off as well. Water the plant and keep it moist, shaded and cool till it is re-established.